Substitute any frozen, canned/drained, or fresh chopped fruit for strawberries and blueberries. Get out four small glasses. Wash all fruit. Divide the strawberries among the glasses. Sprinkle granola over the strawberries. 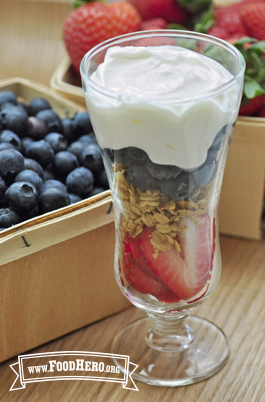 Divide blueberries and place on top of granola. Spoon the yogurt on top of the blueberries. Enjoy! Refrigerate leftovers within 2 hours. 1 Comments for "Berry Blast Off"
This recipe is so quick and easy, great for a snack or breakfast!